I think I’m destined to be an old cat lady… Not one of those crazy, old cat ladies, but an old cat lady who likes to adopt and take in a few cats who are in need of some desperate love. It’s pretty much what I’ve been doing since I was a little kid. I begged and begged my parents to let me have a cat for years. When I finally got one, it wasn’t one that I had gotten to pick out. My house is a cat magnet. Somehow, it gives off some kind of signal that says, “Hey, cats, come live here. It’s okay… Just come curl up on the deck. Sleep here for awhile. You’ll get fed and, eventually, you’ll be let inside.” Out of the three cats I’ve had, only one of them was actually adopted from an SPCA annex. The other two managed to find their way onto our porch and into our home. My first cat, Cookie (Chet), came to us from across the street. I suppose she was just unhappy with the living standards of our neighbors (at one point, they had had three other cats, eight kittens, and two dogs). She started to camp out on our porch during the day and wander back home when it got dark. That is… Until we put bowls of food out for her. She was either surveying her surroundings for the first few days or just waiting ’til we caved and fed her. Whatever her reason, she had gotten what she wanted: A new home. 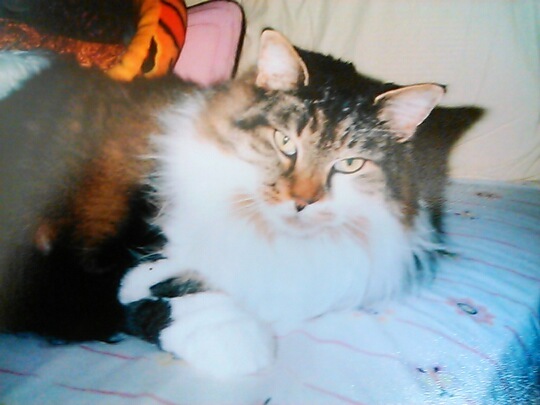 She was a beautiful cat: A white/brown/black long hair with white paws and bright yellow eyes. To most people, she was one of the most unfriendly cats in the world. But to me? She was perfect. She’d sleep in my room all day when I went to school and perk up as soon as I got home. During the night, she’d sleep above my head. Maybe it was because I tried so hard to make her happy? 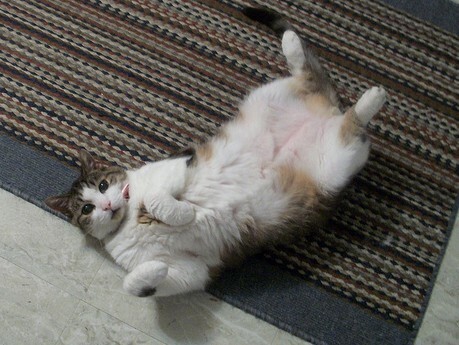 I remember one time when she was meowing uncontrollably in the kitchen (begging for milk), so I picked up the full gallon jug from the fridge and… Dropped it. Milk went everywhere, even under the fridge. My parents were pretty unhappy, but she got to lap some up off the floor and that’s what’s important. We found Outback about five years after Cookie had found us. He showed up on our back deck (hence the name, Outback) around mid-November of 2006. He had the exact same coloring and pattern as Cookie, but he was a shorthair. With winter right around the corner and each night growing cooler, I bugged my mom until she did something to help keep him warm outside. My dad didn’t want another cat at the time, so my mom and I put out a few bowls of food, took a chair from our patio table, and built him a little tent to live in out of soft towels and a heating pad designed for cats. My mom and I would even sneak Outback into the house when my dad would leave to teach class and let the little kitty enjoy some actual warmth. When we eventually convinced my dad to take him in, Outback turned out to be a trip. His first visit to the vet showed us that he wasn’t actually a stray. He was already neutered, indicating that he had either wandered from home or been abandoned… And he was diabetic. If he didn’t get insulin shots, he wouldn’t make it. So, naturally, we paid for the insulin, the needles, and gave him his regulated dose. It was worth it to keep such a sweet kitty in the house. Plus, he was a friend for Cookie. Every cat deserves to have a friend. We adopted my current kitten, Orion, after we had lost Cookie and were close to losing Outback. After Cookie passed, I wanted Outback to be able to have a friend. We brought Orion into our home when she was two months old. She was this fuzzy, little, black and grey ball with big eyes. At first, she spent most of her time batting at Outback and pouncing on him, trying to get him to play with her. But as he aged, Orion began curling up next to him and cleaning the back of his head and neck. Now she’s four years old, a little pudgy, and the only cat in the house. She seems content to have it that way, though. 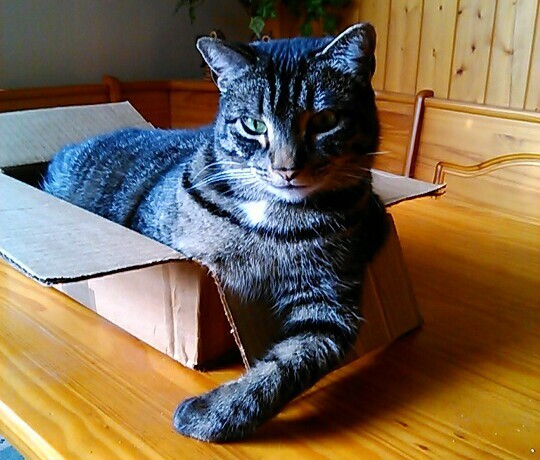 She gets control over every cardboard box in the house. And as long as she’s happy… Well… So am I.